Created by Josef Strachovsky (1850–1913), a sculptor from Praugue, the standing bronze figure of Karel Havlicek (1821– 1856) was portrayed as though he is giving an impassioned speech—with one hand clutching his cape and the other extended out in a dramatic fashion. The Bohemian journalist, critic, and poet who had advocated for constitutional reform and national rights was considered a martyr because he died soon after an unjust arrest and four years of exile. Chicago’s Havlicek statue was placed on an elegant granite plaza with steps and a wall that included the following inscription: “In him Bohemia lost one of her best sons, a fearless defender of her rights and liberties, a man of sterling character. For which life sacrificed, his life!” In July of 1911, the festivities for the new Karel Havlicek Monument included a parade with elaborate floats followed by a procession of adults and children dressed in traditional Bohemian costumes. Governor Charles S. Deneen and Mayor Carter Harrison II unveiled the monument. 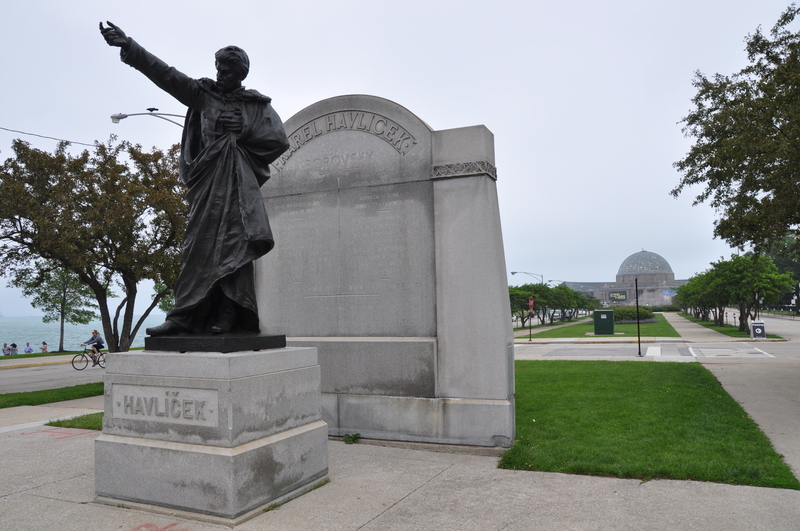 Over the years, the Karel Havlicek Monument was frequently vandalized and damaged. In 1976, the communities of Cicero and Berwyn, which both have large populations of Bohemian and Slovak Americans, asked the Chicago Park District to allow the monument to be relocated to one of the two suburbs. Although the Park District did not approve this proposal, it complied with the Czechoslovak Society of America’s suggestion to find a new location for the sculpture in Chicago. In 1983, the monument was conserved and installed on Solidarity Drive near the Kosciusko and Copernicus monuments. Unfortunately, portions of the sculpture’s granite exedra were demolished when it was erected in its current location. View of monument in the center of Northerly Island’s Solidarity Drive looking east.